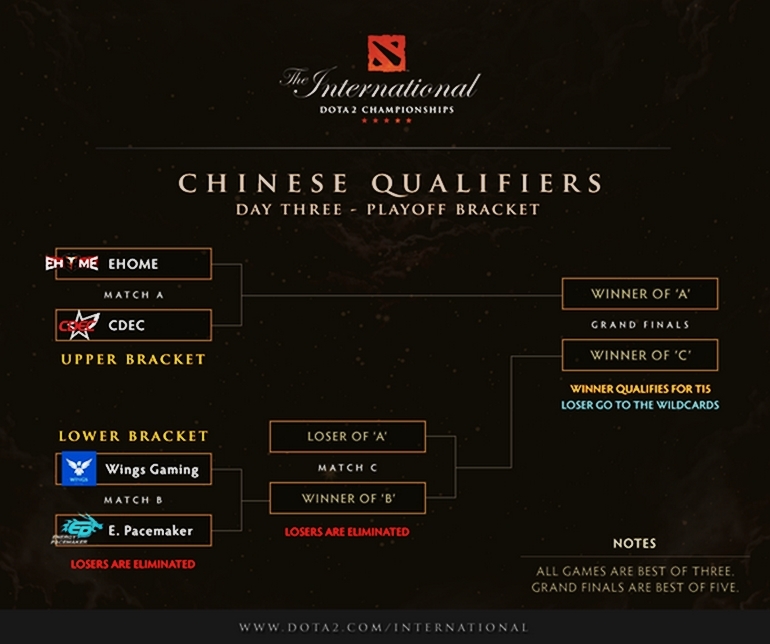 The TI5 Chinese Qualifiers group stage finished out with the top two teams in each group advancing into the playoffs. 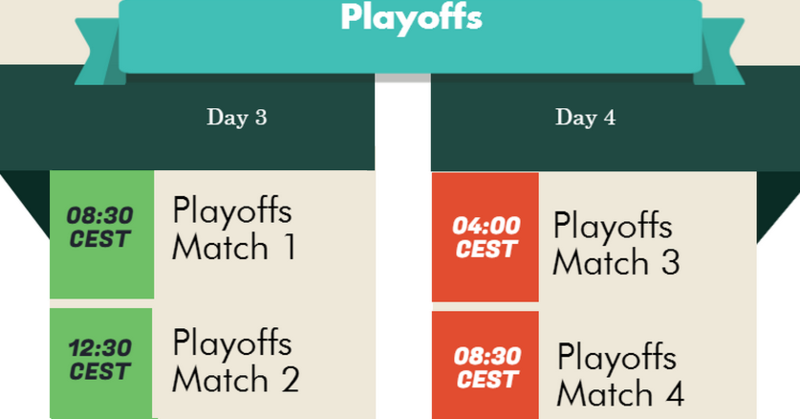 Matches start tomorrow, May 26, at 08:30 CEST. Stay on top of the TI5 main event: results and brackets, schedule, fixtures, streams, broadcast times. E-Home and EP topped their Group, with 8 and respectively 7 points. E-Home will be placed into the Upper Bracket, while EP will begin the playoffs in the Lower Bracket. 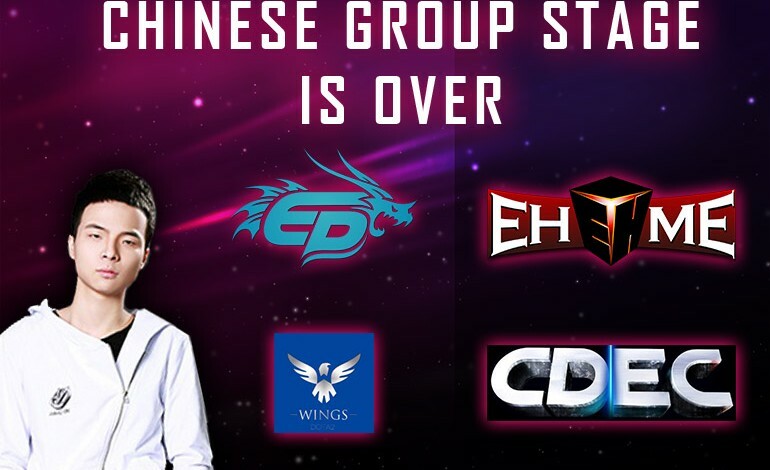 In Group B, CDEC and Wings Gaming will advance to the playoffs. 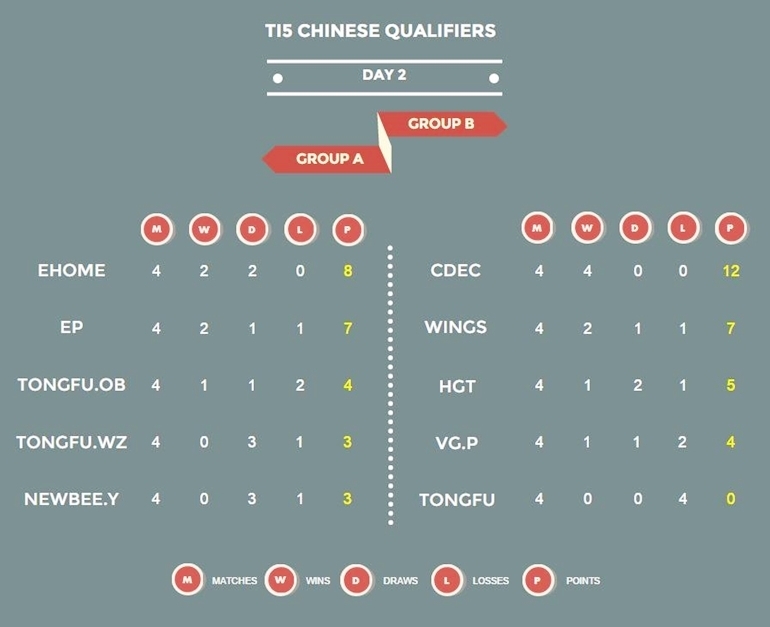 CDEC will face E-Home in the Upper Brackets, and Wings Gaming will meet Energy Pacemakers in the Lower Brackets. First place teams will start in the Upper Bracket. Runner-up teams will start in the Lower Bracket. The TI5 Chinese qualifiers are broadcast in English as part of the “Mega Hub” coverage provided by Twitch and the PGL studios. The Mega Hub coverage brings 35 Dota 2 personalities under the same roof. Chinese coverage can be found here. In a confrontation between Old and Young, each team would take a game in the series. First blood went to Newbee.Young on the bottom lane, while the top lane Juggernaut fell to Dark Seer, evening things out for the teams. That would prove to be the last kill that OldBoys would grab in the early game, with Newbee.Young securing a 5:1 kill advantage and the lead. By 30 minutes into the game and a score of 34:13, Newbee.Young would end the game easily. In the second game, Newbee.Young drew first blood and immediately traded it for a death of their own. Kills continued to be traded in early game. However, OldBoys kept the advantage the entire time and managed to push through to the base and win the second game, after two four-man wipes in their favor made it too difficult for Newbee.Young to recover. Energy Pacemakers took first blood and second kill on top lane to start the game. 13 minutes later, Tongfu.Wz secured their first three kills, increasing their gold by 3k. 26 minutes into the game, a fight at Roshan with three kills on Energy Pacemakers gave TongFu.Wz another 3k in gold. However, as Energy Pacemakers went to Roshan, Tongfu engaged, resulting in a 3:1 trade that gave Energy Pacemakers their lead back. EP would continue to farm and take towers to increase and maintain their lead, eventually leading to their victory. TongFu.Wz had the better draft going into the game. First blood went in the way of EP. A few skirmishes and pick-offs in the early game gave EP the kill lead, but TongFu.Wz maintained the slight net-worth lead. At minute 15, a smoke gank attempt did not turn out as good as TongFu.Wz expected. After that fight, Windrunner became top two in net-worth. EP was not able to repel the push on bottom barracks at minute 30. After they lost the bottom barracks, they started to get picked off even more. At 43 minutes into the game, TongFu.Wz made mega creeps and “GG” was called. With impressive plays straight from the beginning, the score was already 3:3 two minutes into the game. Shortly after that, TongFu.Wz‘s lineup started to fall apart, as they didn’t have the best heroes to repel Spirit Breaker and Weaver rotations. By ten minutes, the score became 13:5 in favor of OldBoys. The game could have been a bit easier for TongFu.Wz, but the unusual purchase of midas on Clockwerk and Windrunner hurt them a lot, as they had no fighting items. At minute 22, OldBoys took the midlane barracks and Tongfu.Wz called “GG”. An interesting pick coming out from TongFu.Wz with a Huskar. First blood was scored at minute six by TongFu.Wz. At minute 14, they lost two of their towers and got four-man wiped. Shadow Demon managed to survive with only 5HP. At minute 19, a kill on Templar Assassin helped OldBoys secure a Roshan for themselves, as they were already dominating. At minute 22, they got a three-man wipe and set their goal on farming and taking towers. At minute 28, TongFu.Wz lost bottom barracks and “Zhou” Chen Yao on Gyrocopter scored a Rampage. A great repel by TongFu.Wz on the mid barracks was not enough to stall or change the game. E-Home scored first blood on the top lane but Newbee.Young returned the kill immediately, evening out the score. The game continued to be even in farm and kills with E-Home having the slight advantage. Despite the lack of kills going into mid game, E-Home was able to pull ahead in net-worth thanks to Tiny’s farm. By minute 19, both teams were even in kills and gold and started to push quickly, entering each other’s bases at minute 21. Despite Newbee.Young having more kills, E-Home was leading in net-worth, and both teams were about equal in their progression towards base. Taking Roshan at minute 25 gave Newbee.Young some advantage, as they smoked and headed towards top lane, where four of the E-Home heroes were, killing Tiny and Io and gaining back some map control. At minute 27, Newbee.Young re-entered base, getting multiple kills, including a full team wipe. They retreated and the game continued another eight minutes before ending. First blood was secured by Newbee.Young and again a kill was returned by the opponents shortly after. Early game was pretty aggressive with many fights and kills. E-Home had a slight advantage, despite being behind in kills. A big five vs. five fight on top lane at minute 14 would result in a five-man wipe on Newbee.Young and two hero deaths including Bristleback and Leshrac for E-Home, giving the latter a 5k gold advantage. A few ganks from E-Home would propel them further ahead. Game ended in 43 minutes. ViCi Gaming Potential took the first two kills, but Wings Gaming was still leading in net-worth by 500 gold thanks to the stacks from Wisp. The game progression was very even with kills and towers being traded on both sides. Wings Gaming tried to sneak Roshan, but were unsuccessful and ended up giving Gyrocopter the aegis and losing the team fight. Some smart plays coming out of Wings with the Tiny-Io combo prevented ViCi Gaming Potential to feel secure and take objectives effectively, even resulting in them giving a Roshan to Wings Gaming, as they feared losing the barracks and stayed close to base. At minute 42, VG.Potential ended up losing barracks and dying with more than three heroes at a time due to relocate saves on Tiny with just 1HP. At minute 50, Wings Gaming took the third Roshan and game was over shortly afterwards. An amazing play by ViCi Gaming Potential on Leshrac managed to get them the first blood in the mid lane duel between Morphling and Lich. The great start was almost the only positive thing going on for ViCi Gaming Potential, as their other cores were not doing well. At minute 23, Wings managed a four-man wipe on ViCi Gaming Potential and headed to Roshan. ViCi Gaming Potential were never able to recover and suffered death after death until they called “GG”. The top rune fight gave a 1:1 Treant Protector and Witch Doctor trade, with first blood going in the way of HGT. The early game was even for the first four minutes, with CDEC gaining the gold advantage in farming. CDEC continued to dominate and control the game with 5:1 kills in their favor and a 2k gold advantage at just six minutes into the game. They continued to gain momentum, achieving all objectives easily and by 20 minutes they were leading 9:2 in kills and 14k in gold. With nothing that could be done to stop the loss, HGT called “GG”, 24 minutes in. CDEC had the advantage in early game, farming more efficiently than HGT. HGT drew first blood by minute six. CDEC continued to increase their advantage until a fight on the top evened out the net-worth about nine minutes in. Despite being behind in kills, CDEC was able to farm more. After about 20 minutes, they suffered a team wipe in the radiant jungle. HGT – with double in kills and about 3k gold advantage, went to Roshan. CDEC caught them at the pit and the following fight cost HGT three deaths including a buyback-dieback on Spirit Breaker and the loss of Roshan and aegis. CDEC steadily gained advantage and started to maintain control of the game. 41 minutes into the game, CDEC suffered another four-hero wipe and a significant decrease in lead on the top lane, followed by another one only three minutes later. It seemed that HGT was going to win, but CDEC was able to take Roshan at minute 52. Some significant kills brought CDEC back into the game. Wings Gaming grabbed first blood in the Radiant jungle before the creeps spawned, taking out Bounty Hunter. It would be seven minutes until another kill was made in the game. The early game was fairly even until, about 13 minutes in. CDEC was leading by almost 1k gold, with Gyrocopter and Shadow Fiend topping the chart in net-worth. After a fight in the top lane at minute 16 gave Wings three deaths, they started to turn the game and Morphling moved ahead of Shadow Fiend in net-worth. At minute 41, CDEC took Roshan and headed to the bottom barracks, with Gyrocoptor having a “Godlike” streak, while Morphling was approaching their base. The score was even, but gold was 5k in CDEC’s favor, evening out again around minute 50. CDEC took Roshan, as Wings smoked and went mid as a group. At minute 62, CDEC smoked and went mid. The defending base fight resulted in Wings losing four heroes, three of which bought back, and GG was called one minute later. First blood was secured by CDEC. Just over seven minutes, the score was 4:0 in favor of CDEC. A gank attempt ended up in 4 hero kill for Wings. As the game progressed with fights and farming, Wings was very far ahead, but then a turn in the game made things even. After 68 minutes, the game was even in kills and gold. TongFu picked up first blood and kept their lead in gold and kills for most of the early game. Around minute 14, a really big fight on the bottom lane ended with a three for four trade favoring TongFu. The game progressed with back and forth smokes and skirmishes. By 28 minutes into the game, TongFu had a lead in gold and XP, had taken down most of the towers, had just taken Roshan and were leading in kill score. Their Shadow Fiend was leading in net-worth by a considerable amount, almost 6k ahead of WindRunner in the second spot, and by minute 29, they were breaking highground. ViCi Gaming Potential were able to defend and hold them off, and another base attempt by TongFu about 42 minutes in resulted in them losing three heroes and retreating. Around minute 45, a fight on the mid lane cost them four heroes with no deaths for ViCi Gaming Potential. Another fight near the Roshan Pit, at about minute 48, resulted in a five for one trade in favor of ViCi Gaming Potential, now swinging the kill score and gold in their favor. ViCi Gaming grouped up and went mid lane with a two for one trade fight in their favor before pushing into base and taking mid barracks. 53 minutes into the game, TongFu attempted to break highground again, but were repelled and as they retreated the fight that followed gave ViCi Gaming Potential another five for one trade, as they managed to push mid lane into TongFu’s base forcing the buyback on Shadow Fiend. At 69 minutes into the game, ViCi Gaming Potential took Roshan and headed into the base but with deaths and buybacks on both sides and four men out on ViCi Gaming Potential, TongFu attempted to take barracks but were repelled once again, as the heroes were respawning. GG was called at minute 76. TongFu picked up first blood and then another four kills before ViCi Gaming Potential could get their first kill on the board. Io got a solo kill on the bottom lane and the score increased to 7:1 in favor of TongFu. The team was able to maintain their map control and lead advantage, getting kills after kills. Ten minutes into the game, the score was 13:3 in favor of TongFu with more than 5k gold advantage. Slowly, ViCi Gaming Potential made a few kills and by minute 13 they caused a four-man wipe on the middle lane and almost evened out the advantage TongFu had. While TongFu went to Roshan at minute 17, VGP went in and soon after before Roshan was completed a big fight ensued with deaths and buybacks on both sides. Another fight on top lane at minute 20 was in favor of ViCi Gaming Potential. ViCi Gaming Potential continued to try to push forward into base with more tradeoff fights. “GG” was called after 32 minutes. First blood went to CDEC. Despite TongFu being ahead with kills, 6:1, in the early game, the net-worth was even between the teams, until CDEC was able to steadily increase their advantage. The following fights in the game primarily favored CDEC and by nine minutes they had a 1.5k gold advantage. CDEC dominated the game and ended it with the same momentum in 30 minutes. CDEC once again took first blood. The early game was fairly aggressive with nine kills in the first seven minutes, seven of them for CDEC who was also leading in gold. By nine minutes into the game, CDEC had clearly established their dominance. A four-hero wipe out by CDEC was about as much as TongFu could handle. “GG” was called after 13 minutes. Wings drew first blood and the next two kills, which were the only kills in the game for about 13 minutes, when Wings went to take Roshan and HGT contested it. Wings would take three more heroes out in the fight, without losing a single one. Wings completely shut down HGT and dominated the game, ending it in just under 30 minutes with a score of 14:1. The second game was much better for HGT. Things were about even in kill trades and net worth for some time, until about minute 15 when HGT started to pull ahead and gain control of the fights and the game. They would continue to gain momentum and dominate with a substantial kill and gold lead. At about 24 minutes into the game, HGT would team wipe Wings. At minute 30, Wings Gaming would wipe out four heroes and take the Roshan, but it wasn’t enough and they would call “GG” after another 13 minutes.